Ramblings of a Daydreamer: Author site launch + very first teaser from Blue Sky Days! 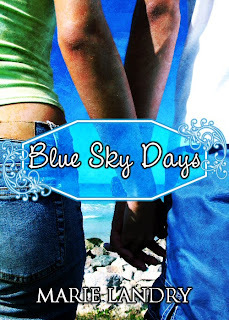 Author site launch + very first teaser from Blue Sky Days! Hi everyone! Today's a big day for me - I'm officially launching my brand new author site - Marie Landry, Author! It's where I'll be posting information about Blue Sky Days, plus all my future work. I'll be blogging occasionally over there - mostly about the book, writing, my journey to publication, etc - but Ramblings of a Daydreamer will still be my main blog. I'm hoping to have some swag soon so I can start hosting giveaways, and in another couple weeks I'll be sending the eARCs out to reviewers, so hopefully I'll have some reviews to post soon! To celebrate the launch of my new website, I'm posting my first official teaser from Blue Sky Days. You guys will be the first people to read anything from the book other than my betas, proofreaders and editor. I'll try to post a teaser or excerpt from the book at least once a week until the book launch in January. Make sure to keep an eye out around the blogosphere, because some fantastic bloggers have offered to post teasers and excerpts too! If you'd like to post one on your blog, please let me know - I'd be so grateful! Synopsis: A year after graduating from high school, nineteen-year-old Emma Ward feels lost. She has spent most of her life trying to please her frigid, miserable mother - studying hard, getting good grades, avoiding the whole teenage rebellion thing - and now she feels she has no identity beyond that. Because she spent so many years working hard and planning every moment of her life, she doesn't have any friends, has never had a boyfriend, and basically doesn't know who she is or what she really wants from life. Working two part-time jobs to save money for college hasn't helped her make decisions about her future, so she decides it's time for a change. She leaves home to live with her free-spirited, slightly eccentric Aunt Daisy in a small town that makes Emma feel like she's stepped back in time. He neared the top of the hill, peering out at me from under long, dark lashes, with his eyes shadowed by the brim of his hat. A blissful floating sensation started in my stomach and rose slowly to my head, like a helium-filled balloon caught by the wind and set to dancing through the sky. I tried to force myself back down to earth as he got closer and closer, finally stopping in front of me. Congrats on getting your website up and running and good luck with all your books stuff! Such an exciting time! I really need to get my website going. I have a domain, but that's the extent of it. Ooh this sounds like a great book! Congrats on the new site! Congrats! YAY! I'm following your official page now too. :) Love the teaser. Congrats! I'm so happy for you. :) I totally can't wait to read Blue Sky Days.